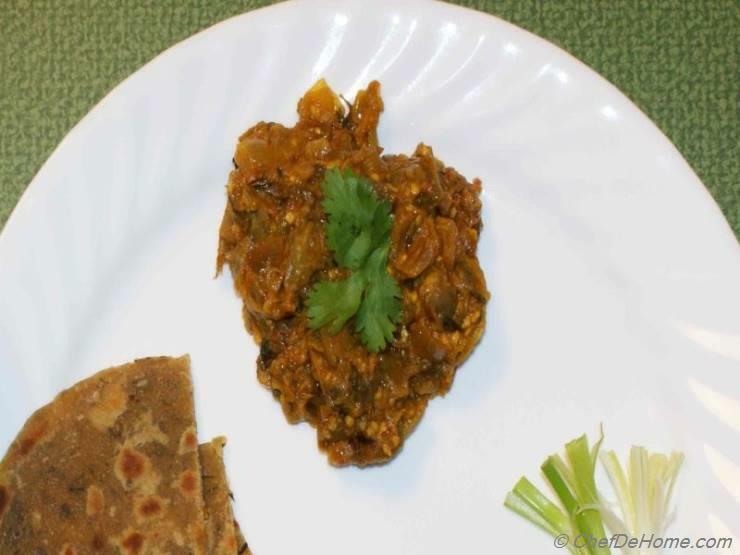 Another reason to love eggplant with delicious vegetarian baingan bhartha (or bharta) recipe. A North Indian classic dish, baingan bhartha (Roasted Eggplant Curry) is a unique eggplant recipe. 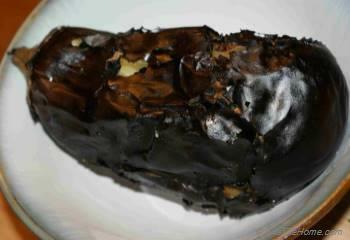 Eggplant are charred on open flame or roasted in oven to burn the skin and cook eggplant pulp in its own moisture. 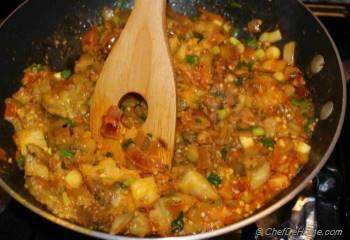 Then cooked eggplant is sauteed with spices to make delicious Indian Vegetarian Main Course. Roasted eggplant is generally kept in a tight lid container or wrapped in aluminum foil to loosen the skin in its own steam. 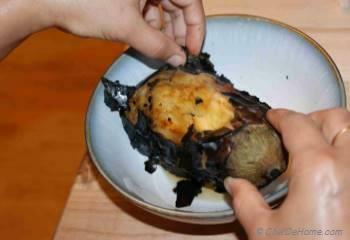 After 10-20 minutes, charred skin is peeled off. Cooking eggplant this way gives this dish roasted smoky flavor and velvety eggplant taste. 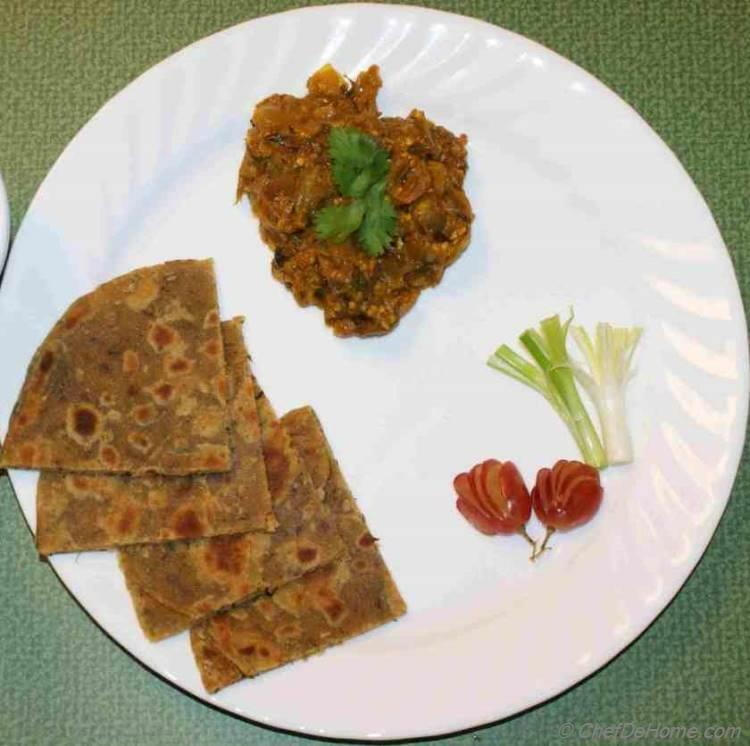 Every region in India has their own version of baingan bharta; traditionally bharta is made with charcoal roasted eggplant, sliced or mashed then fried with curry spices, tomatoes and onions. You can serve Roasted Eggplant Curry with variety of Indian breads. 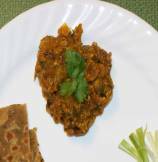 Often I serve eggplant curry with whole grain bread or whole wheat Chaparti. You can also serve this delicious eggplant dish as dip with Corn or Pita Chips. 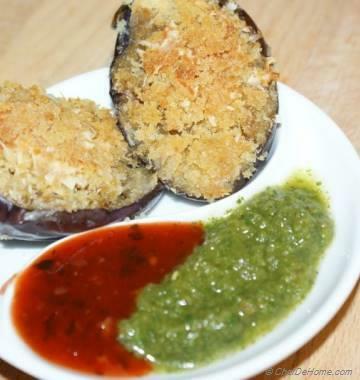 This eggplant(baingan) recipe is vegetarian, vegan and also gluten free. Just make sure that bread/rice you serving with it is as per your special diet needs. Total Time 40 minutes Prep Time 20 minutes Cook Time 20 minutes Difficulty Easy Yields 2 Servings Serves 2 Notes Served as main-course with Indian flat breads. 1. Leave eggplant on open gas flame Or Grill. 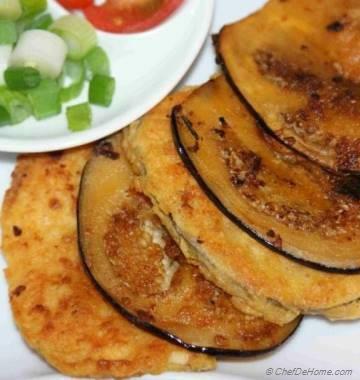 Thick outer skin of eggplant will not let burning of pulp, but as skin gets charred and split, eggplant pulp will be cooked and juices will start to run out. Turn a few times to properly char the eggplant. 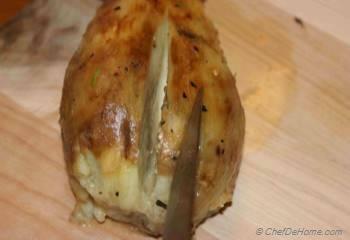 Eggplant is done when skin is fully charred from all sides and eggplant is soft to touch. 2. Let eggplant cool in a covered bowl for 15-20 minutes. Cooling makes eggplant easy to handle. Steaming in closed container makes charred skin easy to peel. 3. Make some vertical slits in the eggplant to check for the quality of seeds. If eggplant is too ripe, you will notice bigger white seeds. I prefer to remove these seeds. However, smaller, average size seeds are ok.
4. 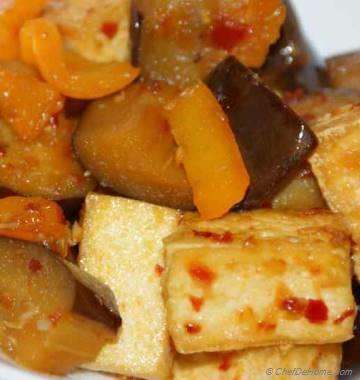 Coarsely chop eggplant and do not throw away stem. It tastes equally good. If you desire, you can also chop eggplant in a food processor till roughly chopped. 5. Heat 3 tbsp Oil in a heavy Bottom pan. 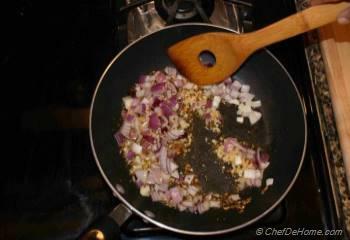 When oil is hot, add cumin seeds, red onion, garlic and fry for 2 minutes. 6. 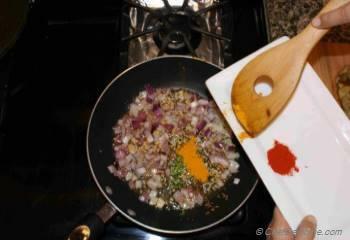 Add green chili pepper, turmeric and red pepper powder and fry for 1 more minute. 7. Now add chopped tomatoes, salt and continue frying till tomatoes are soft. About 6-7 minutes. Add green onions half way through cooking tomatoes. 8. Add eggplants and fry for 5-10 minutes. Stir 3-4 times in between. Eggplant will turn brown on frying and all components of dish will come together. 9. 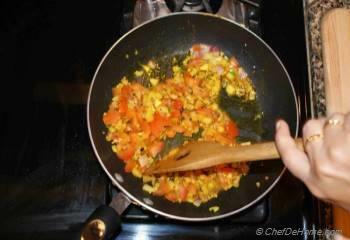 Remove from heat, serve hot or cold with your choice of bread. 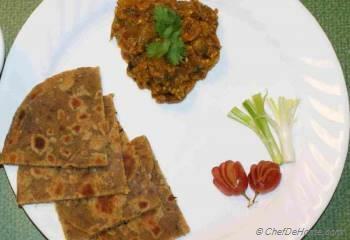 In recipe photo, I have served it with triangles of wheat parantha. 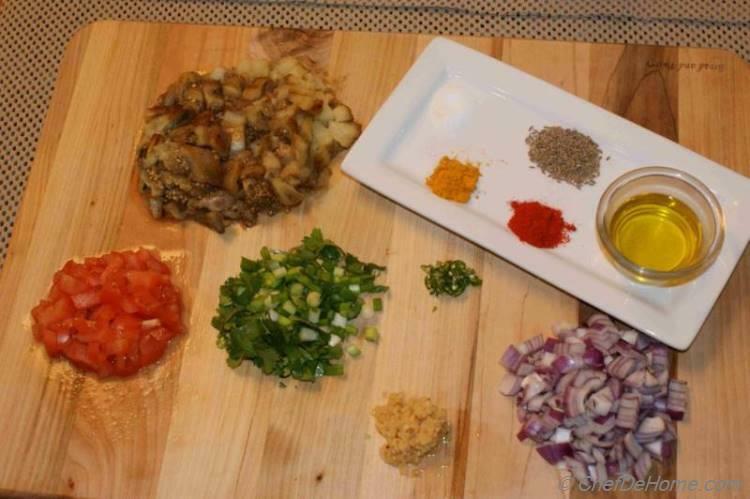 Will have to cooking this sometime this week.It looks delish!